Don’t let the kale scare you. This is good. Like, really really good. Somehow I came to the realization that kale cooked low and slow in a bath of meat juices is delicious. Like, true southern collards delicious. They melllllttt in your mouth. Melt, people. They melt, and then I melt cause i just can’t believe kale can be so good. It’s one big melting party. Yes, that’s a party you want to be invited to. Not like the party of your good friend’s bratty little daughter that you get guilt tripped into attending. We all have a friend with a bratty daughter, right? The worst part is that you spend 30 minutes in the toy aisles of Target trying to pick the perfect present for that little girl because deep down you feel the need to impress her. You don’t know why, and you wish it weren’t true, but it is and regardless of how much time you spend tinkering with every single pink plastic toy, analyzing them, it doesn’t matter. Cause she’s already going to hate whatever it is you get her because you’re old and boring. Ok, so maybe that whole last part is just me, but whatever. I know you know a bratty little girl. Point is, the melting kale party is wayyyy better than that party. Come to my party and forget all about bratty girls (young or old) and that kale is supposed to taste bad. Cause it is so, so good. In a large dutch oven heat 1 tbsp bacon fat over medium high. Working in batches, brown the meat, making sure not to cook it through (it can turn tough). Set browned meat aside. Lower heat to medium and add the 2nd tbsp bacon fat. Once it’s melted add the onions, garlic, smoked paprika, and sage to pot, along with a big pinch of salt and fresh pepper. Cook about 8 minutes, or until the onions begin to soften and turn translucent. Make sure to stir frequently so the mixture doesn’t burn. 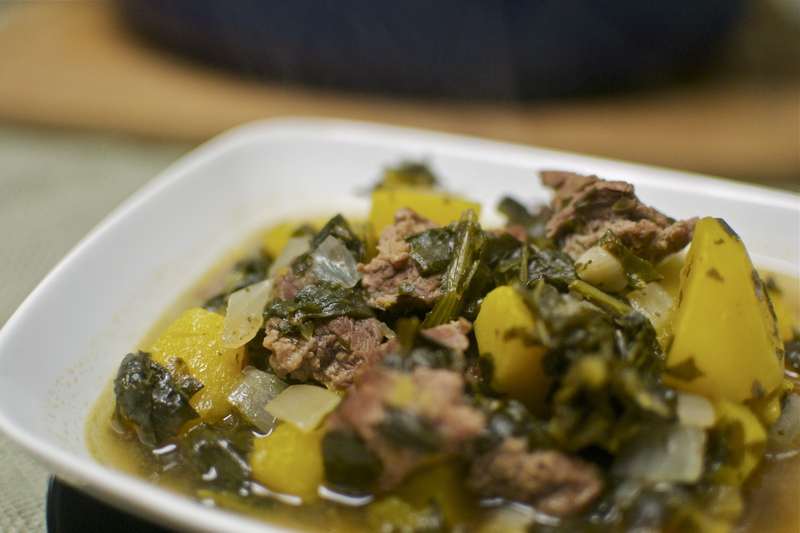 Add the beef, butternut squash, and kale to the pot. Stir to combine, then add the chicken stock and two cups of hot water. Bring to a boil, then reduce to a simmer and let cook, covered, for at least an hour. I let mine go about 45 minutes longer. Serve and enjoy. Store leftovers in the fridge for up to a week. This makes a HUGE batch of stew. Gosh, this looks so good! I need to make sure I try it! Awesome!! So glad you enjoyed it 🙂 thank you! I need to say-this was fabulous. I’m not a big soup fan but I LOVED this. Thank you for sharing! This was great! Easy, too! We added a little pepper to spice things up. yum, sounds good! Thank you 🙂 ! The ingredient part of the recipe calls for beef stock and the cooking directions calls for chicken stock. Which is it? The picture looks like chicken stock??? You reference chicken stock in the directions, but have beef stock in the ingredients. I presume beef is really preferred. Do you really use 4 c of stock plus 2 more c of water? That just seems like so much liquid, but maybe it works! Thanks! Whoops thanks for catching that! yes, beef stock is preferred, but either would be good. I like my stews to have a good amount of liquid. Feel free to omit the water if ya like! Going to try this after my next shopping trip, loving the squash and kale idea! Do you ever do this in a crockpot? I haven’t tried, but I would think it would work well on low! I’ve made this 3 times now, with slight differences. First time I made it as written (with beef broth, but without extra water). Turned out great but the beef wasn’t as tender as it could have been. 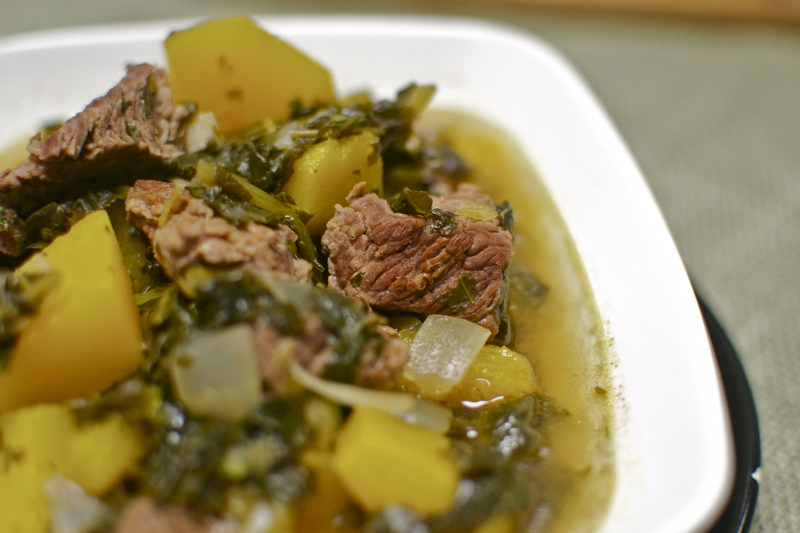 Second time I made it in the crock pot, the beef was great but the butternut squash completely disintegrated. My solution has been to cook the beef separately in crock pot (with beef broth/water), then use the beef broth from crock pot to make soup, which I cooked separately from beef. So basically I did the beef ahead of time, set it aside, and used the juices to make the rest of the soup, and added beef at the end. Because I used the homemade broth from the crock pot it still tasted very beefy. It turned out great. I also like to add quinoa (but I don’t know if that’s paleo). Dusted beef with coconut flour for a great browning sear in coconut oil. Fresh chopped kale. Organic beef broth. 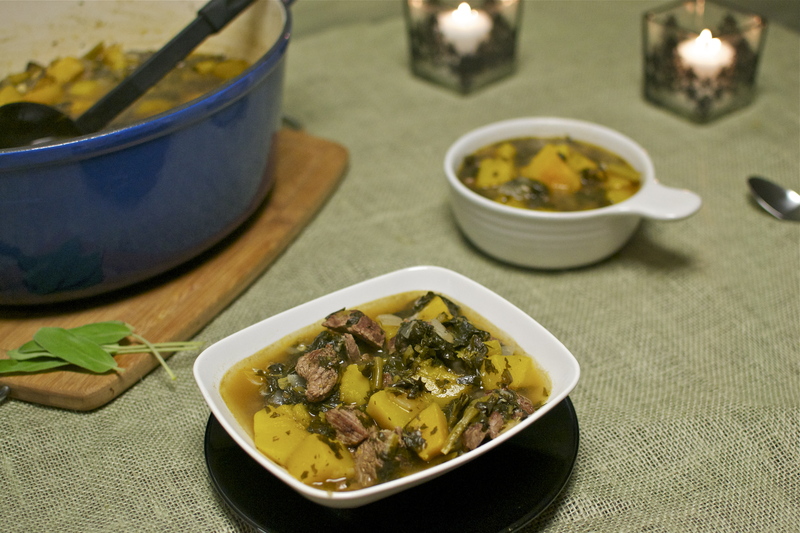 Made this tonight, minus the sage because I forgot it at the store, and add some carrots. It was delicious! I loved this far more than I anticipated, simply because I dislike kale. I have tried sautéing it, and also I have added it in soups before but just blanched, and disliked it. 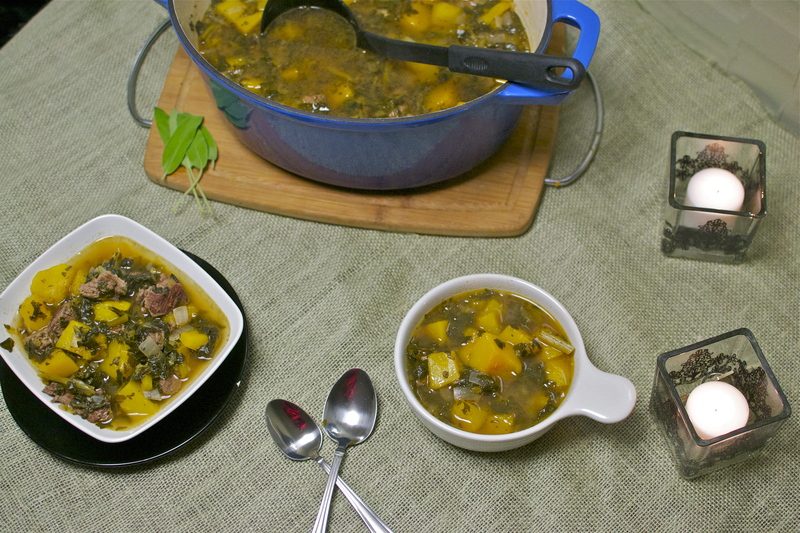 However, this very much tasted like southern collard greens, especially with the smokey flavor of the bacon fat. 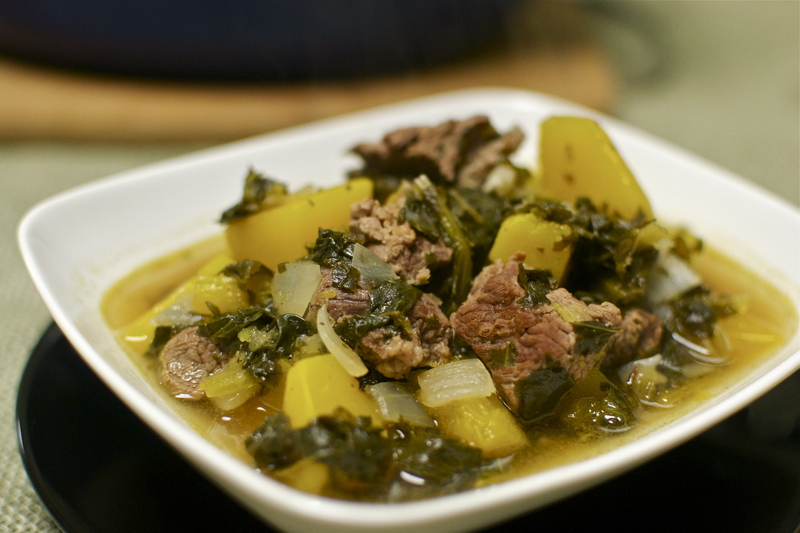 The mild flavors of the root vegetables and beef with the smokiness of the bacon and earthiness of the kale was a delightful combination, and I most certainly will be making this again! !